Stellar occultation observations will provide the first precise size and albedo results for this very small cold classical KBO, a full 18 months ahead of the 1-JAN-2019 New Horizons encounter. The ability to get this information for MU69, as well as an extremely sensitive search for potentially dangerous (and interesting) rings provides a rare opportunity to fine-tune the spacecraft encounter sequencing of observations. Given that there is no second chance at this flyby — and no other KBO spacecraft encounters likely for decades — the advanced information from the 2017 occultations will provide critical support to improve the scientific return from the upcoming New Horizons encounter. In the broader context of Kuiper belt studies, the cold classical population is thought to be one of the most pristine remnants from the period of planetesimal formation. The albedo of MU69 is a potential indicator of exposed surface frosts, which in turn would constrain heliocentric formation distances and subsequent impact, sublimation and UV-photolysis histories. Obtain size, albedo and ephemeris information for 2014 MU69 — and perform a ring search in its vicinity — in support of the New Horizons mission to MU69. Observe MU69 on three occasions as it occults or makes appulses with bright stars on June 3, July 10 and July 17, 2017. Use GAIA catalog star positions and HST astrometry of 2014 MU69 to predict the narrow occultation path. Observe at 2Hz or faster to resolve the object's size and search for narrow rings. Note that there are currently two potentially useful MU69 occultations predicted for 2018, but neither is as good as the three 2017 events. More importantly, the 2018 events do not provide enough lead time (only about 6 months) to be useful for New Horizons encounter efforts. We anticipate the following results from this observing program: size and albedo information for 2014 MU69 to support the New Horizons 1-JAN-2019 flyby; potential shape information (from multiple chords); an improved orbit solution for MU69 to aid targeting of the New Horizons flyby; a search for rings or other material around the object — potential hazards and new observing targets for the New Horizons mission. The primary goal of this project is to provide mission support for the 1-JAN-2019 New Horizons flyby encounter of 2014 MU69. Occultation observations will be very sensitive to thin rings around MU69 and provide the first size and albedo constraints for this small KBO. With enough measurements we can even determine whether this KBO is non-spherical. The three 2017 events provide critical and fundamental information about the flyby target a full 18 months in advance of the encounter. SOFIA and ground-based telescopes will both be used for one or more of these events. SOFIA will have four key advantages over the ground-based telescopes that we expect to deploy in South America and South Africa: a much larger aperture, immunity from cloudy weather, the ability to reposition with very short notice and the ability to produce high-SNR lightcurves at 20 Hz. SOFIA's aperture allows frame rates of 20 Hz with SNRs of 19.2 for the faintest of the proposed occultation stars. The event sky velocity is 24 km/s, which means that SOFIA will search for rings with 1.2-km sampling in the sky plane surrounding MU69. Furthermore, model-fitting of the light curves allows SOFIA to measure chords with precisions of 300 m to 50 m (depending on SNR) rather than 1.2 km. Ground-based observatories, both portable and mobile, are better able to cover a wide swath around MU69 to greatly increase the chances of a successful solid-body occultation. The baseline time resolution we need is 0.5 sec (2 Hz). Given the sky-plane velocity, a D = 40 km body would give a 2 sec central chord with 4 data points. This baseline is set by the parameters of the June 3 event. Table 1 lists the three occultations that we propose to observe. June 3 and July 17 are to be pursued with ground-based mobile telescopes. July 10 and perhaps July 17 will be attempted with SOFIA. The Feasibility section describes some of the technical parts of this effort. †Note: these paths show the prediction as of mid-2016. See the main page for current predictions. Visible and thermal IR fluxes have determined the sizes, albedos and effective temperatures of many KBOs . Occultations have yielded sizes, shapes and albedos for several large KBOs [2,3,4]. IR spectroscopy has identified volatile ices on several KBOs (e.g., N2, H2O, CO, CO2, CH4)[5,6,7]. The presence or absence of specific volatiles are crucial evidence for (a) the heliocentric distance at which an object's building blocks formed and (b) the heating history of an object's surface (i.e., what volatiles would be retained given an object's surface gravity, albedo and insolation and impact histories). Colors have been determined for fainter KBOs . Color information is useful when objects are too faint to identify specific frost constituents from spectra. Methane-based frosts are thought to form red and brown hydrocarbons after UV photolysis or radiation by charged particles, whereas neutral colors may be due to water-ice. Resonant objects occupy resonances relative to Neptune's orbit (e.g., Pluto is in a 3:2 resonance with Neptune) and tend to have large eccentricities and inclinations as a result. Classical KBOs are not locked into resonances with Neptune. Within the classical group are cold classical objects, with inclinations less than 5°, and hot classical objects with larger inclinations. An additional group, the Scattered Disk Objects, are thought to have had close encounters with Neptune or other large planets, but are not currently in a resonance with Neptune. An HST survey revealed that a large fraction of cold classical KBOs (at least ~30%) are binaries. This is interesting in light of the slow impact velocities expected in the cold classical population — one might expect many contact binaries. Close visual imagery of MU69 by New Horizons will be invaluable in constraining its impact history (is it a fragment of a catastrophic disruption? a contact binary?) and may refine models to explain the high incidence of binaries. Neutral and red colored KBOs have been found in the hot classical population, while the cold classicals are virtually all red. Furthermore, while red KBOs are, in general, fainter than neutral ones, the cold classical population has higher albedos than the rest of the Kuiper belt . Taken together, these various observations have led to various explanations for the diversity of colors and albedos in the Kuiper belt. For example,  consider heliocentric distance and the ability to retain various volatiles: they propose that objects formed at cold classical heliocentric distances (MU69 has a semi-major axis of 44.21 AU, for example) could "uniquely retain NH3, which has been shown to affect irradiation chemistry and could plausibly lead to the unique colors of these objects." 2014 MU69 is much smaller than any cold classical KBO for which size and albedo have already been determined. Because of its size, 2014 MU69 represents an important observational control: a cold classical object that occupies the same heliocentric distance as larger cold classical KBOs but has a much lower surface gravity. The comparative albedos of large KBOs vs. MU69 lets us isolate surface gravity as a factor in the retention or loss of volatiles on cold classical KBOs, or interpret the presence of volatile ices as evidence of a recent event on MU69. Spacecraft flybys are unforgiving — there are no second chances to re-observe the target in response to the flyby observations. The occultations are a rare opportunity to learn something about MU69 before the New Horizons encounter on January 1, 2019 and help this New Frontiers-class NASA science mission better plan its unique flyby of its main target. Here are ways that observations of the MU69 occultations or appulses can help plan the encounter observations. The size of MU69 determines the area of terrain to image over the short flyby interval. Size scales with radius2, so advanced knowledge of the radius could dramatically improve estimates of imaging requirements to cover the sunlit face of MU69. The average albedo of MU69 not only determines imaging and spectroscopy integration times, it also could indicate the presence of widespread water ice (which is very stable in the Kuiper belt) or more volatile ices — recall that Pluto's small moons, similar in size to MU69, all have extremely high albedos and H2O ice on their surfaces . Prior knowledge of a high albedo on MU69 would elevate the priority of MU69 spectroscopy to identify frost components and their distributions. If the surface is extremely dark (~4%), the object will be ~40 km across. While this is good for area to image, it results in a very dark surface and will require changes to the mission design to minimize smearing for the longer exposure times required. An occultation will pinpoint the position of MU69 at the tens-of-km level — something no other astrometric technique can do — from which an improved orbit can be obtained, enabling better targeting of this object to be calculated in advance of the encounter and reducing fuel needs for trajectory corrections. Provide a sensitive search for rings or arcs far around MU69. Knowledge of these in advance of flyby will improve the safety of flight for New Horizons and will also provide critical information for flyby designers to study these objects at close range. There is also a chance that the occultation chord would intercept a companion moon, if one exists. Given the rings recently found around the Centaur Chariklo , we need to consider the possibility of rings or other material around other small objects as a flight hazard for close approach as well as targets requiring dedicated observations if known in advance. Running at 20 Hz, SOFIA and other large ground-based telescopes will sample the sky in the vicinity of MU69 with 1.2-km resolution. If the rings are narrower than 1.2 km but optically thick, then the limiting width of detectable rings depends on the SNR. 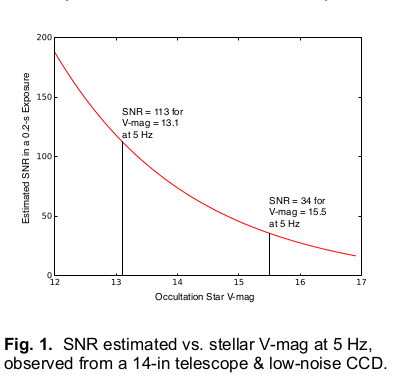 A 600-m ring would be detectable with a SNR of 10 for the fainter occultation stars (V=15.5 on June 3 and July 10), but the brighter occultation star (V=13.1, July 17) would allow detection of a 110-m optically-thick ring. The three bright stellar occultations by MU69 represent a significant observing challenge. The main difficulty is the small size of MU69 (expected to be between 20 to 50 km), which means that the shadow path on the Earth (also 20 to 50 km wide) is a thin target for SOFIA to hit at precisely the right time. On the ground, the size of the object sets the spacing between observing sites and the number of telescopes dictates the range of prediction error we can cover. The goal is to get a minimum of two chords on the body while covering ±3 sigma of the ground-track uncertainty. Furthermore, the sky velocity of the events are 20 to 24 km s-1, which means that the event durations will range from 1 to 2.5 s. Fortunately, the combination of the GAIA astrometric catalog and HST/WFC3 observations of MU69 will give us incredibly accurate astrometry of the occultation stars and MU69 itself, referenced to a common astrometric network of stars. Note that getting good limits on rings or dust does not require getting a solid body occultation. Ground-track predictions are based on HST observations of MU69 and GAIA measurements of the target stars. The HST data is still being collected. The final prediction update for the June 3 event is expected on May 27. The final prediction for the July events will be finalized just in time for the July 10 SOFIA observation. The error in the occultation predictions from HST imaging is close to the expected diameter of MU69 itself. Vilenius, E., Kiss, C., Müller, T., et al. 2014. "TNOs are Cool": A survey of the trans-Neptunian region. X. Analysis of classical Kuiper belt objects from Herschel and Spitzer observations. A&A 564, A35. Sicardy, B. et al. 2011. A Pluto-like radius and a high albedo for the dwarf planet Eris from an occultation. Nature 478, 493. Ortiz, J.L. et al 2012. Albedo and atmospheric constraints of dwarf planet Makemake from a stellar occultation. Nature 491, 566. Braga-Ribas, F. et al. 2013. The Size, Shape, Albedo, Density, and Atmospheric Limit of Transneptunian Object (50000) Quaoar from Multi-chord Stellar Occultations. ApJ 773, 26. Dumas, C., Gourgeot, F., Carry, B., et al. 2015. Near-infrared spatially resolved spectroscopy of 136108 Haumea's multiple system. AAS Meeting Abstracts, 225, 115.06. Lorenzi, V., Pinilla-Alonso, N., & Licandro, J. 2015. Rotationally resolved spectroscopy of dwarf planet (136472) Makemake. A&A 577, A86. Dalle Ore, C.M. et al.2009. Composition of KBO (50000) Quaoar. A&A, 501, 349. Romanishin, W., Tegler, S.C., & Consolmagno, G.J. 2012. Our Continuing Program of Optical Color Measurements of Centaurs and KBOs. Asteroids, Comets, Meteors 2012, 1667, 6469. Noll, K. et al. 2008. Binaries in the Kuiper Belt. The Solar System Beyond Neptune, eds. Barucci, M.A., Boehnhardt, H., Cruikshank, D.P., Morbidelli, A. and Dotson, R., p 345. Brown, M. E. Schaller, E. L. & Fraser, W. C., 2011. A Hypothesis for the Color Diversity of the Kuiper Belt. ApJ Letters 739, L60. Weaver et al. 2016. The small satellites of Pluto as observed by New Horizons. Science, 351, aae0030. Braga-Ribas, F. et al. 2014. A ring system detected around the Centaur (10199) Chariklo. Nature 508, 72. Young, E. et al. 2011. Development and Performance of the PHOT (Portable High-Speed Occultation Telescope) Systems. PASP 123, 735.